Being a foremost organization in this industry, we are actively engaged in offering the finest quality range of Designer Wooden Mirror Frame. 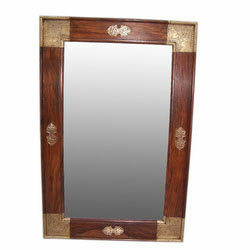 Made of superior quality wood, this Wooden Mirror Frame has exquisite designs making it all the more unique. Having a polished finish, this item is a perfect decorative piece and useful too. Hang this striking distressed mirror to complement your weathered design scheme. Featuring aged wood undertones, heavily distressed slate-blue coloring and rustic ivory accents, this eye-catching mirror looks at home in your beach house, entryway or bathroom. The generous size of this mirror makes it functional as well as decorative, and it can be hung both vertically and horizontally. With firm commitment to quality, we are engaged in offering our patrons Decorative Wooden Mirror Frame. These are designed and developed by the professionals in such a manner that meets the customized requirements of our esteemed clients. Our offered wooden mirror frames are appreciated in the market. 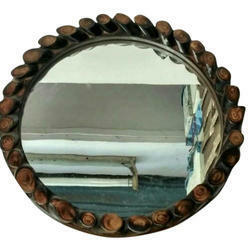 We are the leading manufacturer and exporter of Wooden Mirror Frames. Wooden Painted Mirror Frame. Made of wooden painted with high quality paint.